At APM Terminals' inland services facilities in San Antonio and Santiago, Chile, safety supervisors previously monitored activities on the ground. Now the latest technology is enabling their work to be done more effectively and safely. APM Terminals is amongst the first to use drones for security and to drive operational efficiency. The drones are clearly visible in the air above the facilities, moving about their various tasks. “Our safety supervisors are the ones tasked with keeping the people and activities at our facilities safe, but by doing their jobs next to container stacks, trucks and other machinery, they were exposed to the highest risks," said Hector Espinoza, director for Latin America at APM Terminals' subsidiary Container Operators S.A.
“I knew the mining industry was having success with drones for safety, so we started testing it out," he said. 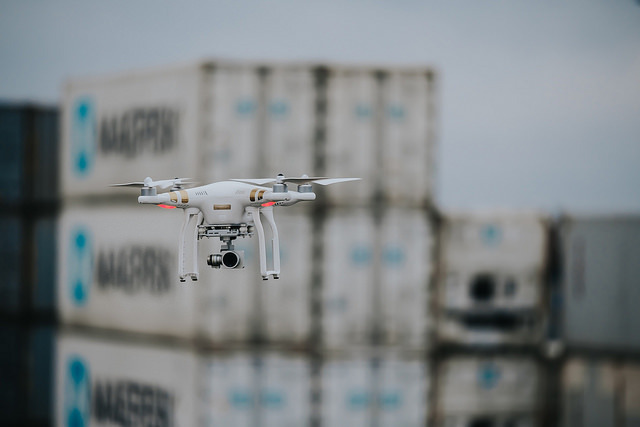 Work began in 2016 and since then drones have been used periodically to film the site's operations, monitor traffic flows and container stack efficiency as well as for observing unsafe behaviour, such as truck drivers leaving their cabins. Now operations can be documented and analysed from above, a viewpoint that was previously unavailable. Three drones are being operated, one in Santiago and two in the company's larger facility in San Antonio. Safety supervisors are able to focus on workshops and areas with less machine traffic. Other risks, such as high container stacks, are also monitored. All visitors to the terminal are required to agree to the facility's safety policies, which outline the rules in force as well as the presence of the drone. Earlier versions of the drone were only equipped with a camera but now each unit has sensors for night-time flying as well as a speaker to communicate directly with people on the ground. The drones are guided by geofencing - a route map for flying. The pilot has a live-stream view, so he can make phone calls to the necessary people or even fly in and use the speakers to inform a truck driver that they need to get back into their truck. 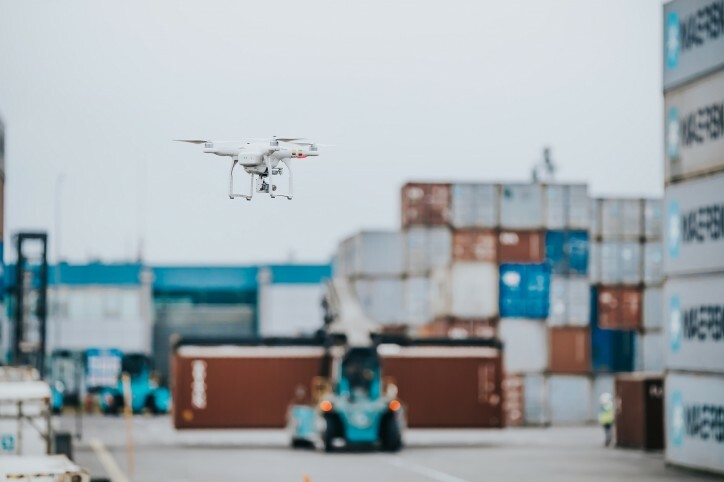 “Since the arrival of the drones, visibility of terminal operations has improved considerably and 'hot spots', such as traffic flow, container stack efficiency and unsafe behaviour can be identified instantly," said Espinoza. The drones can also perform previously dangerous tasks such as rooftop and crane inspections. “Blind-spots between high-density container stacks now are totally visible from a bird's eye view," Espinoza said. The management team in Chile has plans to systematically review all critical tasks using the drone, he said. This low-cost initiative to reinforce the company's commitment to safe operations is expected to quickly catch on at other APM Terminals' locations.